Railpictures.ca - Bill Thomson Photo: Conrail GP40 3189, still in patched Penn Central black, leads a repainted U25B on a freight crossing the International Bridge into Canada at Fort Erie, Ontario in November 1977. | Railpictures.ca – Canadian Railway Photography – photographie ferroviaire Canadienne. 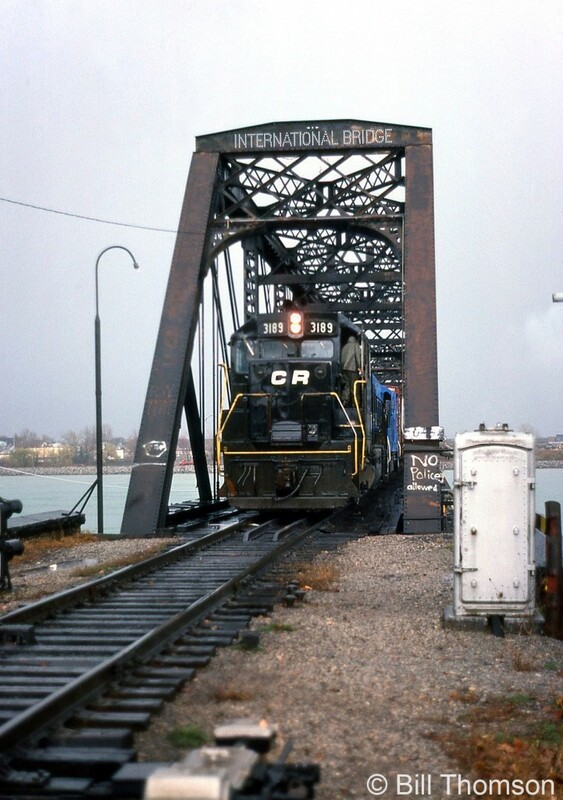 Caption: Conrail GP40 3189, still in patched Penn Central black, leads a repainted U25B on a freight crossing the International Bridge into Canada at Fort Erie, Ontario in November 1977. Looks like it’s fresh from the shop.